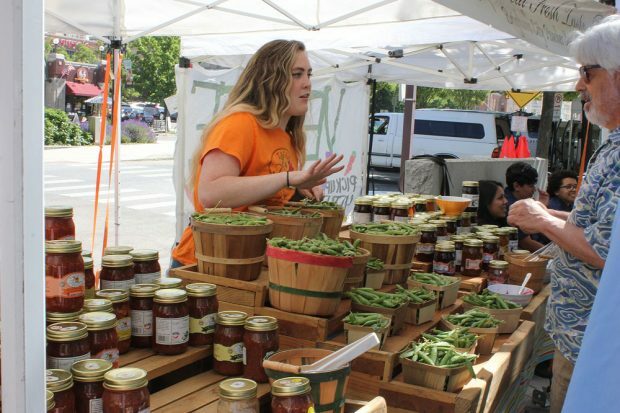 The Downtown Farmers Market kicked off last week at Pioneer Park, as floods of visitors take to the booths to enjoy the warm weather and friendly atmosphere. Offering a diverse selection of local and unique merchandise, you can find just about any kind of locally farmed produce at the Pioneer Park market. From organically grown and freshly picked beats, leeks, spinach, potatoes, lettuce, strawberries and cherries, to local dairy products like butter, yogurt and milk. And for the carnivores, freshly butchered meat from lamb to grass fed beef if available from multiple vendors. Lost? Confused? Not sure what to buy? The friendly vendors are more than happy to offer ideas and tips. Be sure to ask for a sample before you buy. Food trucks and food stands also make an appearance at Pioneer Park, with local vendors offering ready-to-eat deliciousness at competitive prices. The Pioneer Park market offers more than food, though. Arts, crafts, books and even entertainment are all available from local craftspeople, and one of the more unique booths is run by inmates of the Salt Lake City County Jail. Get there early to beat crowds and heat! With so much to see and do at the market, it’s a must do activity for the summer. It’s a good reason to get out of the house and see what Utah has to offer locally. Though as idyllic as all this sounds, the summer season is here in full swing, and the park heats up quickly. The farmers market is open every Saturday 8 a.m.-2 p.m. through October 21. The market is located at Pioneer Park, 350 W. 300 S., in downtown Salt Lake. More information can be found at the Farmers Market website. Some of the best buskers in Salt Lake can be found at the Downtown Farmers Market at Pioneer Park. The Downtown Farmers Market brings in various food trucks, including Buzzed Coffee. Plants for your home or garden can be purchased at the Downtown Farmers Market. Several musicians come to the Downtown Farmers Market every Saturday to serenade the crowd while they shop. The Downtown Art & Craft Market runs alongside the Downtown Farmers Market and features locally made clothing, photography, ceramics and jewelry. The Downtown Art & Craft Market, located on the south side of Pioneer Park, includes a variety of locally made items. A group of local kids chase giant bubbles at the Downtown Farmers Market. New to the Downtown Farmers Market this year is the Beer Garden, where patrons can enjoy craft beer. The Downtown Farmers Market has grown to include a little bit of everything. You can even get a henna tattoo from artists. In addition to produce, you can buy other locally made products at the Downtown Farmers Market, such as local honey. The Downtown Farmers Market in Pioneer Park is a great place to buy produce grown by local farmers.